Read the latest global developments in our customs and international trade publication. This report provides the latest information on the opportunities and complexities encountered by companies doing business in Latin America. Inside, we summarize the discussions and findings from the EY Global Trade Symposium. Also, see how managing trade is changing in today’s environment. EY’s approach to the growing complexities inherent in today’s global trade function. The Mexican Taxing Authority has instant access to your transactional level data. Watch to find out how EY can help you use this same information to identify risks, reduce costs, map your supply chain and strategically evaluate your Mexican VAT position. 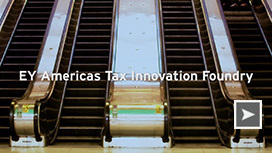 EY Americas Tax Innovation Foundry is a business incubator that works to develop innovative services that address our clients’ needs. Watch to understand how.